I love eggplant but always struggle to find new and interesting ways to prepare it. I know that eggplant parmesan is pretty popular as well as a breaded and pan-fried version, but those always seem too greasy for my liking. I want to taste the eggplant, not the oil. And since I (usually) try to create healthier versions of a lot of food, I try to stay away from things that just sit in grease. It's true that there are exceptions to that rule, but eggplant - which is pretty much a sponge for oil - is not one of those exceptions. I decided one day that the best way to approach the eggplant siting in my fridge was to go simple. I combined a few spices, sprinkled them on the slices and just did a quick cook in a pan. This allowed the spices to release all their flavors and cook the eggplant but still keep it intact and not mushy. I seriously loved this. I pretty much ate the entire eggplant by myself when I made it. And since it's been awhile since I made it (I've got quite a backlog of postings) I'm craving this. A lot. Looks like I'll be grabbing an eggplant during the next shopping trip! 1. Mix spices together and set aside. 2. 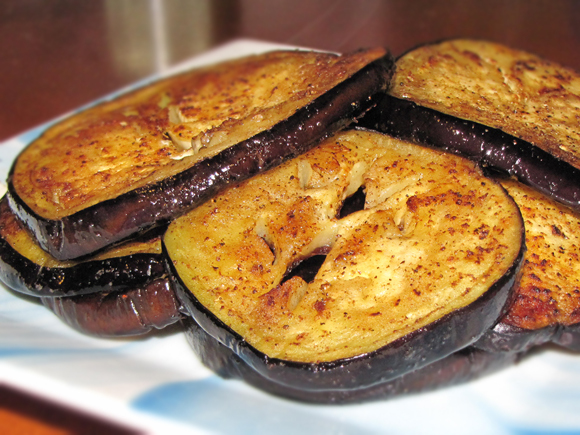 Slice eggplant into 1/2" slices. I keep the skin on to keep everything together, but feel free to cut it off or use a vegetable peeler. The skin can sometimes be bitter, but it's totally edible. 3. Sprinkle each side of each slice with a pinch of salt and let sit for 20 minutes on a cutting board or in a colander. Rinse in cold water and pat dry. 4. Sprinkle each slice (both sides) with a bit of the spice mixture. 5. Spray a non-stick skillet with a non-stick cooking spray and cook the slices over med-high heat until slightly browned on both sides. You don't want them mushy so if it looks like they are starting to get too soft, turn up the heat a little. Alternatively, if the eggplant is starting to burn, turn the heat down a little. The final result should be tender and lightly browned.